Earlier today, RIM took a leap into 2010 smartphone playing field with the launch of BlackBerry 6 and the BlackBerry Torch. While the company has teased fans and techies with previews over the past few weeks, solid details weren’t available until now. RIM’s last major software update, BlackBerry 5, was first made available around this time last year. However, in a market polluted with advanced Android and iPhone devices, RIM faced some stiff competition when attempting to appeal to the average consumer despite well-established business features. With the launch of BlackBerry 6 and the flagship Torch smartphone for AT&T, RIM hopes to retain existing customers and reach out to a whole new audience hopping onto the smartphone bandwagon. With the debut of iOS 4 and Android 2.2, it wouldn’t have made sense for RIM to hold onto their next generation BlackBerry OS for any longer. Version 6.0 brings plenty 2010 features to the mobile operating system. For starters, RIM entirely revamped the home screen interface bringing more user personalization and faster ways to find the most used apps. Also prominently featured is a native Universal Search tool which lets users bring up results from within applications whether it’s an address book, an email inbox, a calendar, or a 3rd party app right from the home screen. A new notification drop down, much like Android, consolidates the latest alerts and reminders from instant messaging, email, and other apps. With an ever-growing dependence on social networks, the BlackBerry 6 Social Feeds feature adds support for RSS, BB Messenger, Facebook, and Twitter. The interface even allows updating status messages for multiple accounts from a single location. Heavy email users can continue to a further improved universal inbox as well. The last generation of BlackBerry devices suffered when it came to web browsing due to a lackluster rendering engine. Fortunately, the new OS sports a webkit-based HTML5 browser with tabbed browsing. Since RIM’s initial concentration was business users, the company never pushed to improve multimedia capabilities. As competing smartphones brought well-polished entertainment features, BlackBerry devices were somewhat left in the dark. However, BlackBerry 6 brings a revamped music, photo, and video capabilities. For instance, the platform supports native playback of the popular FLAC file format, which is popular amongst audiophiles, giving it an edge over iPods, Zunes, iPhones, and Android devices. It of course also supports widely-used MP3s, AAC, WMA, OGG, and a few other formats. And for video, it includes codecs for MP4, H.264, WMV and more. As for RIM’s flagship device, it’s somewhat of a mix bag. There’s nothing astonishing about the design or hardware. The slider form factor, which reveals a QWERTY keyboard under a touch screen, is almost exactly the same layout as the now-defunct Palm Pre. It’s a new design for the company, which deviates from their standard candybar layout. However the reasoning for this layout is clear. The touch-only BlackBerry Storm didn’t suite business users too well and making a multimedia device for the average consumer without a touch screen isn’t possible in 2010. As a result, we have the Torch, a mashup of the best of both worlds. A touch screen offers an intuitive refreshing experience, however long-time BlackBerry users can always resort to the optical trackpad and physical QWERTY keyboard. There are even dedicated keys for Send, Menu, Back, and End. As for hardware specs, there are a few lackings. 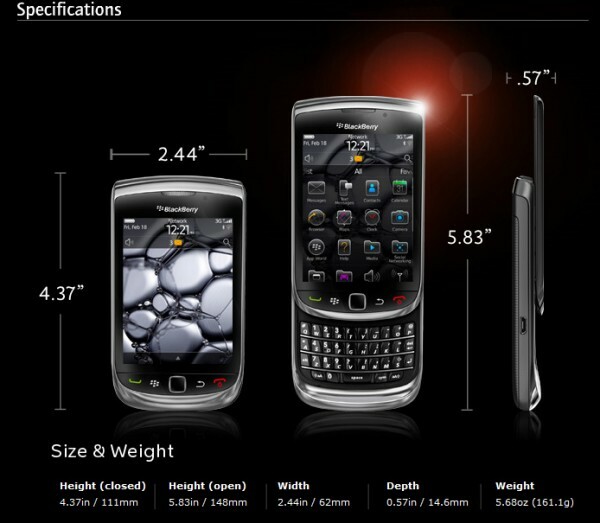 While the Droid X and the EVO 4G sport TI 1GHz OMAP and SnapDragon 1GHz processors, respectively, the Torch relies on a 624 Mhz processor. And in a market with a high pixel density iPhone 4 Retina display and monstrous 4.3 inch screens of the aforementioned Android devices, the Torch falls short again. A 3.2 inch screen is a bit too small and the HVGA 480-by-360 pixel resolution isn’t particularly astonishing. As for other specs, the Torch sports WiFi 802.11 b/g/n, GPS, 3G, light detectors, proximity sensors, and more. There’s 4GB of on-board storage and the device comes with a 4GB microSD (supports 32GB cards). The Torch also sports a 5 megapixel camera with auto-focus, image stabilization, flash, VGA video recording, and geo-tagging. Aside from that, there’s a 3.5 mm headphone jack, speaker phone, Bluetooth, and a few other essentials. 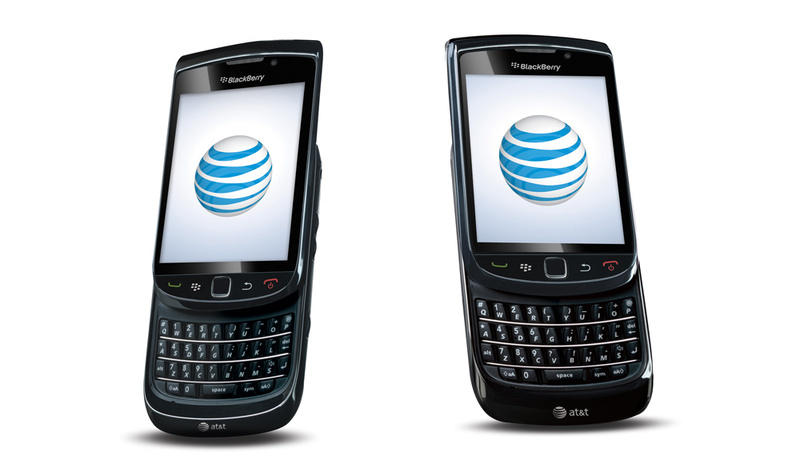 For those considering the BlackBerry Torch, the device will be available exclusively for AT&T customers on August 12th in retail stores and online. Best Buy, Wal-Mart, and Radio Shack will also carry the device initially. As for pricing, the Torch will run customers $199 after signing a new two-year contract. As for data plans, which are required, AT&T offers a $15 option for 200 MB and a $25 option for 2GB of bandwidth.